The first time you visit this route will be briefly in passing through Rustboro, but this is actually a fairly large route, although you need Surf to fully access the northern areas. 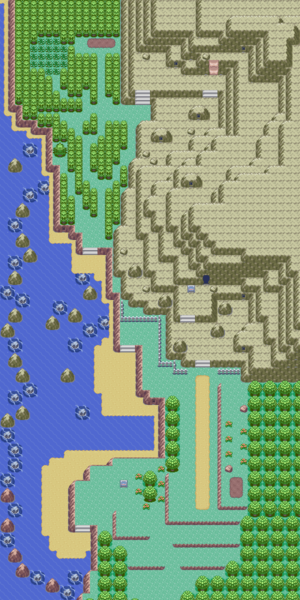 The ledges and trainers in the central section are reachable both by Surf and also when you come out of Meteor Falls. There are quite a few different kinds of wild Pokémon here and there are also items, 6 bluk and kelpsy berries, and 10 trainers. After emerging from Meteor Falls, your plan is to get back to the Cable Car on Route 112 to reach Mt. Chimney and continue on to Lavaridge Town. To do this, it's quite a trek. You will need to go south on Route 115 to get to Rustboro before heading east, through Rusturf Tunnel, to Verdanturf Town. After a quick walk to Mauville City, you again want to go north through Route 111 to finally reach Route 112. This page was last edited on 29 November 2018, at 01:50.